The floats during the 125th Torcher Parade in 2015. Aberdeen University Students’ Association (AUSA) yesterday confirmed that the event, which is the largest of its kind in Europe, will take place in Aberdeen next month. The parade will follow its new route along Union Street, beginning at Albyn Place and finishing on King Street, and will include 20 student built floats and many more students in fancy dress on foot. AUSA’s Raising and Giving Committee has extended the deadline for local charities applying to get a share of the money raised at the event which will take place on March 23 at 6pm. Organisations will now have until the 15th of February to apply. Organisers also hope volunteers will now come forward to help with the behind the scenes planning and to help out on the day of the parade. 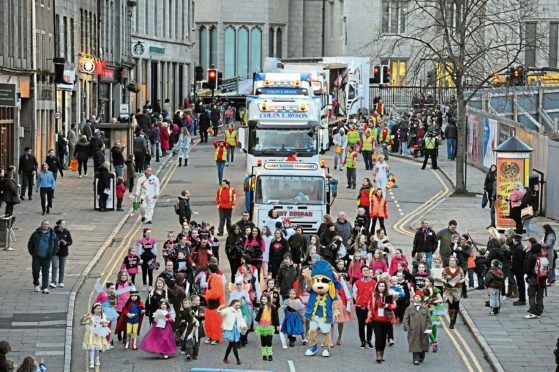 Committee chairman Signe Thye said he was “excited to be bringing the Torcher Parade back to the streets of Aberdeen”. Meanwhile, Aberdeen University also launched plans to launch a new initiative that allows students to watch a virtual open day online. This will give people considering studying at the educational facility a chance to engage with academics, current students and support staff without having to step foot in the building. The virtual experience will be launched over two sessions on February 28. More information about the initiative can be found on the Aberdeen University website.